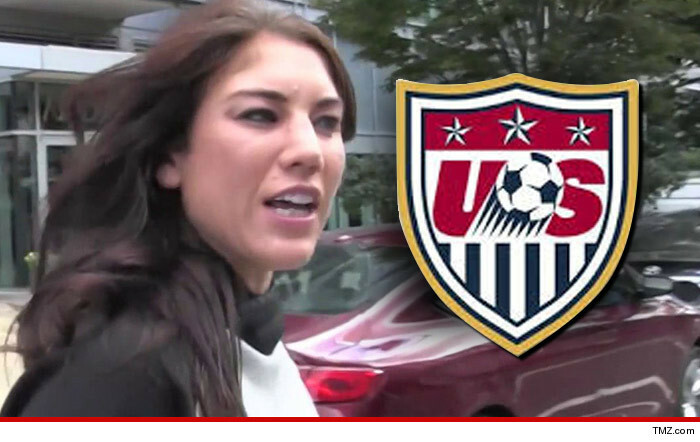 Hope Solo has been suspended by the U.S. Women's soccer team ... just days after she got into it with police while her husband was being arrested for DUI. TMZ Sports broke the story ... Solo and ex-NFL player Jerramy Stevens were "acting belligerent" when Stevens was stopped by cops in Manhattan Beach, CA early Monday morning ... with law enforcement sources telling us both Stevens and Solo were "a major pain." Now, U.S Soccer has issued a statement saying ... "During our current national team camp, Hope made a poor decision that has resulted in a negative impact on U.S. Soccer and her teammates. We feel at this time it is best for her to step away from the team." Hope addressed the suspension on her Facebook page ... writing, "I accept and respect the Federation's decision, and more importantly, I apologize for disappointing my teammates, coaches and the Federation who have always supported me." She added, "I think it's best for me to take a break, decompress from the stress of the last several months, and come back mentally and physically ready to positively contribute to the team."